The first international mind sports games "IMSA Cup" | Uniting seven federations of the traditional mind sports : Chess, Bridge, Draughts, Go and Xiangqi with over 500 National Associations and close to one billion players. 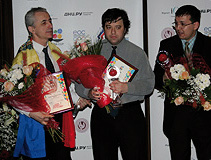 On April 27-29, 2008 the Russian city of Perm was the venue of the first mind sports games “IMSA Cup”. For the first time in history masters of four mind sports, including Chess, Bridge, Draughts, and Go gathered under one roof. A demonstration match within the tournament presented the Chinese chess Xiang Qi. “IMSA Cup” became a dress rehearsal for the 1st World Mind Sports Games to be held in the XXIX Olympic and Paralympic Games host city Beijing, shortly after their ending. The competition was held by International Mind Sports Association(IMSA) and Multisport Association of Russia – the official representative of IMSA in Russia under the auspices of the European Olympic Committee and Russian Olympic Committee. “IMSA Cup” gathered over 100 sportsmen from 11 countries (Russia, Ukraine, Belarus, Latvia, Lithuania, Estonia, Moldova, France, Poland, Czech Republic and Korea). The level of “IMSA Cup” was really high, as a significant number of eminent players took part in the tournament. Alexandra Kosteniuk – Vice-Champion of the World, European Champion and International Grandmaster – participated in the chess tournament. Among the participants in Bridge was the President of IMSA and World Bridge Federation Jose Damiani. Honoured guests visiting “IMSA Cup” included the multiple world champion, President of the International Association of Peace Foundations, Ambassador for the United Nations Children’s Fund (UNICEF) Anatoly Karpov. “IMSA Cup” opening ceremony marked a significant event, which put an end to the discord in Draughts. After six years Russian Draughts Federation resumed its membership with the World Draughts Federation. This was confirmed with a convention signed by the President of World Draughts Federation Vladimir Ptitsyn, President of Russian Draughts Federation Alexandr Zakhryapin and General Secretary of Multisport Association of Russia Alexey Kylasov which acted as an intermediary. The final day of “IMSA Cup” was dedicated to friendly matches between masters of mind games and honourary guests of the competition – European ambassadors – participants of the round table”Russia – EU: not only oil and gas”, which took place in Perm on the same dates. The guests were entitled to play Chess, Bridge, Draughts, Go and Xiang Qi with the winners and medalists of “IMSA Cup”, and with Alexandra Kosteniuk and Anatoly Karpov. At the solemn closing ceremony the prize fund of the friendly match between the champions in mind sports and European ambassadors was remitted to the Federation of physical culture, sport and creation of disabled people of Perm Krai. 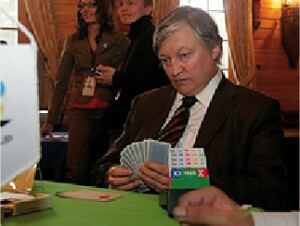 Anatoly Karpov handed the cheque for 10 000$ to a representative of the Federation. In this manner the organizers and guests of the tournament voiced their support to the incipient movement for the promotion and development of mind sports.